who identified the necklace as a relic from the Iroquois Six Nations Confederacyand/or Northern Cherokee. The necklace is what they call a 'family necklace' whichis quite common and essentially the equivalent of wearing your genealogy or a coat of arms around your neck. It was generally passed on from mother to daughter in a matrilineal society. I believe Hannah Maria wanted us to know her heritage, though she and her children and grandchildren were forbidden to speak of it due to prevailing prejudices. The pendant part of the necklace is especially perplexing to even the most expert of my sources. At first, I thought it was a small, animal vertebrae hanging from the main body of the necklace. 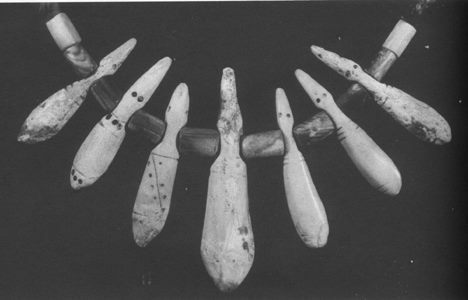 The choker portion of the necklace appeared to be teeth or claws (possibly shark's teeth or turtle claws) with spacers or beads between. But through further research, I have discovered other possibilities. (see below).Humorously, the family thought they were looking at a bear claw necklace, which it obviously IS NOT. She may have had that type of necklace, but it wouldn't have been a family necklace. Following the Snake . . .
similar in representation to the one in the photo, but I have not yet found anyone who can verify if this is indeed what exists on Hannah's necklace, nor the history behind it. There are some Mississippian culture, copper figures that resemble the design, but are flat two-dimensional designs. The Mohican (Mahican) tribe has a symbol that is similar to this design, but it is flattened and two-dimensional. (see below). 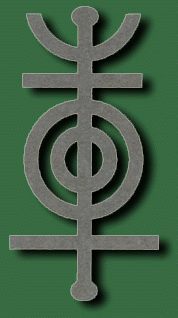 Sculpted in the proper way, the symbol below could be a manifestation of what we can see on the pendant. This is the "Many Trails" symbol used by the Stockbridge Mohicans. The Mohegan tribe, too, has a similar symbol. One can view it at: Mohegan button The lore surrounding it is as follows, and is borrowed from the Mohegan site. "The button is thought to be from the mid-eighteenth century. The carving design in the Mohegan Tribal symbol and has very ancient meaning. The four large domes point to each of the sacred four directions. The design represents the back of the Grandfather Turtle upon whose back all life was created or the wigwams where the Mohegans lived. The v-shaped designs between the mounds of the domes are parts of the Tree of Life, which grows from the roots of Mohegan ancestors and branches toward future generations. The small dots represent people." Unfortunately, I was unable to reproduce the button on this page, so one must shift from this site to the Mohegan Button to compare. My sources say the items on Hannah's necklace gave her "important or special" tribal social standing, such as a "Beloved Woman". Very little is available biographically about Hannah Maria. Her life was controlled by her circumstances. She was apparently not literate, though her brothers and father were. A family journal exists written partially in her father's hand. Other accounts of the family are written in her husband's hand. Oral family lore said that she was a medicine woman. At this point in time (2005) the native people who have chosen to comment on her status say that there is nothing special about her tribal affiliation. 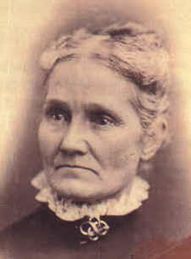 Born in 1823 and raised up in an LDS family, after 1831 but not baptized until 1843, any uniqueness as to her heritage was probably lost forever, as times were brutal for native people. One thing is certain, in the autumn of her life she attempted to bring her two worlds together posing for a photographer wearing her family necklace. The complete answer, when it comes, will ultimately be from elders of the proper tribe within the Six Nations or the modern Mahican Confederacy or Cherokee Nation. The New England tribes pushed to near extinction, joined with other the Iroquoian tribes and pushed to the western frontier. Most of those joined their cousins and brothers in New York, before being forced west to Ohio and then to other reserves, where the United States government always forced them to cede their lands to advancing settlers. It is interesting to study and understand the dynamics and relationships with the tribes. One would think that each tribe was an entity in itself, and to some extent that is true, but all the tribes are inter-related and the process of understanding these relationships can boggle the mind of the uninitiated. Hannah's line was diluted with European ancestry, as was often the case. In the early 19th century we believe the line wasre-infused with Northern Cherokee ancestry. There are many possibilities but written records are scattered, or non-existent.None-the-less, hard to come by. This search too - continues. In looking into this family history, I have come a long way down a fascinating and exciting road. On the way, I have metfamily members from the mid-west who heard the same stories about their direct ancestors for the past 180 years. There still exists within the Newberry family, a homestead steeped in Iowa State history in Lee County, Iowa - where the original people set down roots in the 1830's. Finally, I have met a lot of wonderful, supportive people who have selflessly helped to locate evidence, and in the process forged many new friendships. To these generous folks who are flung like pebbles across our vast continent, I say - thank you for your generosity and sharing spirits! It seems that all the older Elders who might have known, have passed on. The knowledge has passed on with them. So perhaps one day an answer will come to us, but for now, I must put this side, and ask the ancestors to send an answer. If it comes, I will surely let you all know. * Since last fall I have contacted a non-Native author Lois Sher Dubin who has written an beautiful and authoritative volume titled, North American Indian Jewelry and Adornment, Abrams, N. Y., N.Y.; however, she was unable to give any answer regarding this particular object. * I also queried various museums in New York and Washington D.C.. None of whom were able to help very much.